Oh my goodness Otto - are you Aussies at it again?! Your list of bands that you suggest you and Charles chat about on Trivia night is followed by the words While we’re talking things Australian . . . has Ray Columbus become another 'honorary' Australian along the lines of the Pavlova? Ray Columbus was almost the only name (The Easy Beats was the other) I recognized in the line-up so I thought I would make a cheeky comment. To be honest I don't really care (I'm not even a real kiwi) especially when it comes to pavlova; as long as there is plenty of whipped-cream and no passionfruit-pulp anywhere near it and I get to indulge now and then, I don't care who claims its origin. I must thank you indirectly as I've just been enjoying some blasts from the past - Mungo Jerry, Lobo, Terry Jacks, and others via you tube - never mind that I wasn't much more than ten years old when the songs were hits! All great stuff and all liked by my young teen sons - I've raised them well on a wide range of music from The Kinks, Manfred Mann, early Bowie and Rolling Stones, Pink Floyd, Gene Vincent, Van Morrison, The Doors . . Okay, I’ll give you that one, Kara, Ray Columbus and the Invaders were Kiwis. Pavlova originated in NZ, as did a lot of others that we regard as Aussies: Phar Lap, Split Enz, Crowded House (at least in part), Keith Urban, John Clarke, Dragon. . . The practice seems to be that if they are successful and they have a connection with Oz, we claim them as ours. Russell Crowe was born in NZ but we'll leave him for you. "A country of inveterate, backwoods, thick-headed, egotistic philistines"
"I believe we were all glad to leave New Zealand. It is not a pleasant place. Amongst the natives there is absent that charming simplicity .... and the greater part of the English are the very refuse of society." "If it would not look too much like showing off, I would tell the reader where New Zealand is." Otto, my interest in the Masters Apprentices stems from my regular contact with the drummer Colin Burgess. I often have a beer with him. Colin still dresses in 60’s garb. He went on to become the first drummer in AC/DC. 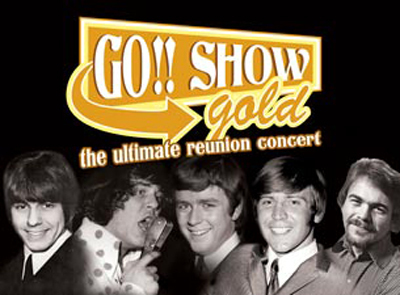 He is appearing in the GO Show, a 1960’s revival, at the State Theatre on 4 May. The poem O Captain! My Captain! 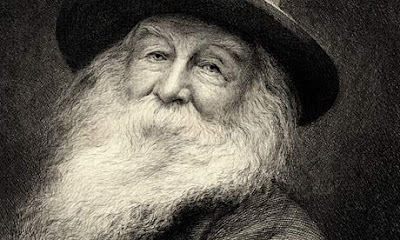 was written by Walt Whitman (pictured below) in 1865 after the death of President Abraham Lincoln. The Captain is Lincoln, the “ship” represents the Union and the “fearful trip” is a reference to the American Civil War. Repeated use of the word “my” emphasises the sense of loss of the writer/speaker, the loss of not only a captain and leader but of his father figure, who was also father of the Union. 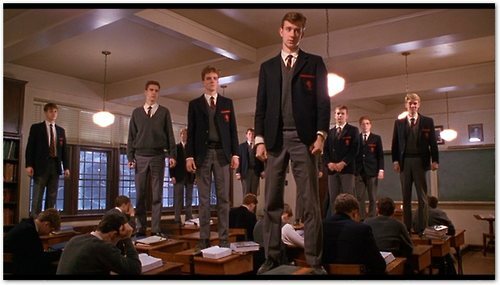 The symbolism of the words spoken at the end of Dead Poets Society to the destroying of Professor Keating and the feelings of loss, sadness and loneliness of the boys, was not apparent to me until I read the poem. Wot about. . . ? As I’ve mentioned before, no one comments on band names posts except to query a name that is missing. Byter Charles, a friend of mine, is no exception. A couple of days ago I posted band names origins for M-O. 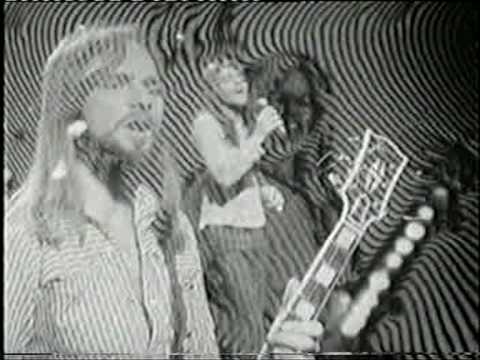 Shortly afterwards I received an email from Charles: “What about the Masters Apprentices?” Had I missed a major group, something current or past, known internationally? No, Charles was referring to a group that had some hits in Oz in the Sxties. You’re showing your age, Chezza. 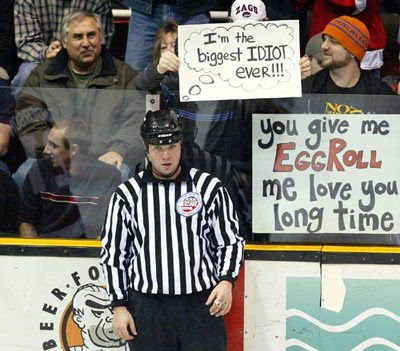 (I will confess that I recall them as well). See the windows of the green house, they’re painted yellow like the doors. See the child who sits in wonder, at this brightly coloured scene. shows them all his tricks. Oh how I wish I were a little boy again, living in a child's dream. While we’re talking things Australian, Charles and bygone days, set the Wayback Machine to 1979, Sherman, for Cottesloe Beach in Western Australia . . .
That was the year that Prince Charles, the 30 year old heir to the throne of England, was taking an early morning dip in the surf during a tour of Australia. Bikini babe and model Jane Priest, 26, ran up to him, grabbed him and planted a kiss on him. The startled Prince kept his hands and arms well away from her scantily clad body. . .
99.9% of the population have always suspected a set up in the ambush, that the meeting was planned and that it was not a lucky coincidence that Flash, Bang, Wallop!, a photographer happened to be at the beach, in the right spot at the precise moment to record the happy scene. Obviously the event was staged for the benefit of publicity and PR value and that Jane priest, the model, was the person responsible. That same year, 2005, the truth emerged: it was a set up for publicity purposes, a staged event, but not by Jane Priest. The whole thing was the work of Charlie and his minders. In 1979 Charles was in need of a public makeover. He was shy, reserved and awkward, not a dashing, eligible bachelor or a force on the world scene. He was a prince in waiting, destined someday to assume the throne but seen by the public as being an aristocratic stuffed shirt. What better to enhance Chezza’s image than for a beach babe to run across the beach, hug and kiss him whilst he is surfing. So thought the palace suits who hired Ms Priest to do the deed. "It's when I see pictures of Charles that it all comes flooding back. I was in my mid-twenties, here was one of the most powerful men in the world and he was absolutely adorable. I was totally overawed for those couple of minutes. My meeting with Charles on the beach wasn't my suggestion, it was theirs. It was a PR thing to try and make Charles more accessible. It was a set-up photograph of the Prince of Wales meeting an Australian native, but he threw a spanner in the works. When he saw me he dived into the water, so I thought I'd follow him in, but as I went in, he got out. So I followed him out, hair ruined, make-up ruined, and I felt like such an idiot. I actually went and put my hands on his chest to give him a kiss and Charles said: 'No, I can't touch you, I can't touch you.'" The spin succeeded, Charles made the front page of most Western newspapers. 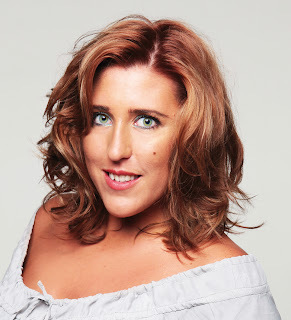 · After having been picked for the job, she met with Prince Charles the night before The Kiss On The Beach to make sure that she was suitable. · A single mother at the time, her 5 year old son was sitting on the beach building sandcastles. He is now a scientist. · Ms Priest continued as a successful model, obtained a degree in Fine Arts and worked in television. She married and declared herself “deliriously happy”. 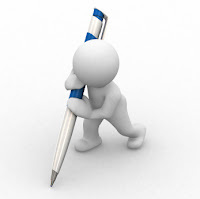 Today I am writing unashamedly as a proud father. I will tell you why a little later. From the days that Acacia was 8 years old she showed an interest in design. At that age and later she sometimes spent time with me in my office, invariable annoying the secretarial staff by decorating telephones, shorthand pads, calendars and the mail book with flowers, scroll work and other graphic design elements. From early high school years she had decided on what she wanted to do with her life: become a graphic designer for a magazine such as Harper’s Bazaar or Cosmopolitan. Regrettably her dreams and aspirations were not shared by some of her teachers. In her final year she was told by the school careers and guidance counsellor and her art teacher to consider an alternative choice; another teacher suggested that she aim for something realistic. 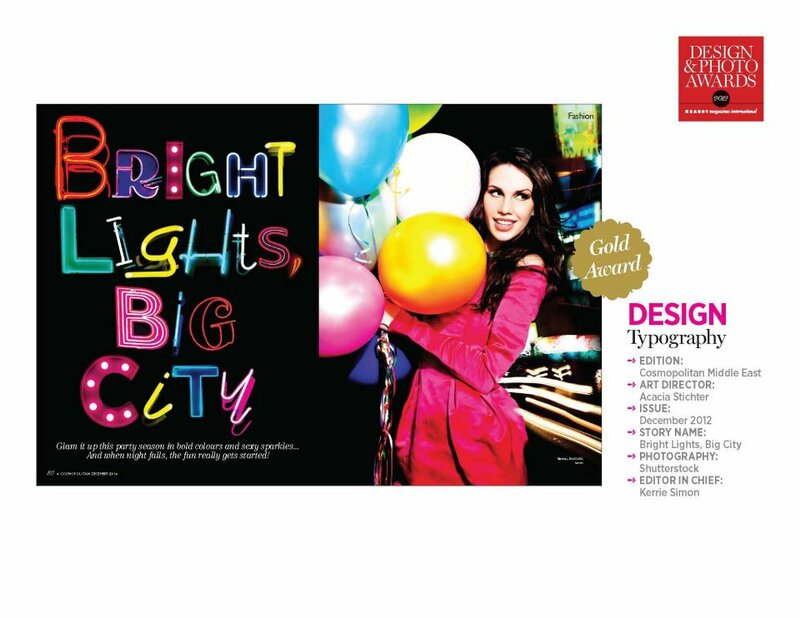 She ignored them and won a partial scholarship for a graphic design course at KVB College in North Sydney. Importantly she also wrote to various magazines offering to work voluntarily as a work experience student. For those two years Acacia assisted and worked one day each week, without pay, for a variety of magazines, acquiring experience and knowledge and being given increasing responsibility. Ultimately she was assisting with photoshoots, production and design. At college graduation she applied for a full time position as a graphic designer with various magazines in Sydney. Although Acacia made it to the short list for Vogue, her lack of experience meant that those who had already been in the industry for some years were preferred. It’s a similar conumdrum in every industry and occupation: employers prefer to engage people with experience but you can't get experience if you're not hired. Then Cosmopolitan called. Having interviewed various persons and not being satisfied they went through past applications and saw Acacia’s again. She was called in, interviewed and hired. From there she worked her way up, worked for Cosmo, Cleo and various other mags in the ACP stable, as well as some stints freelancing in Sydney and in England. Last year Cosmo called again and recruited Acacia and a team of other girls from various parts of the world – England, Ireland, the US – to start up Cosmopolitan Middle East. Acacia has been living in Dubai and is the art director for the mag. I recall that a year or so after Acacia had finished high school and after she had started with Cosmo, I had accompanied her to her old high school for a function. She pointed out to me the teacher who had told her to select a more realistic career choice, at which point I said “I might have a few words with that teacher” and began to move towards him. Acacia stopped me and asked me not to, telling me that there was nothing to be gained by it. She was right, if he didn’t have it within him to encourage students to follow their dreams, to make their lives extraordinary as Mr Keating put it in Dead Poets Society, then nothing I could say or do would make a difference. A little bit later the headmistress approached Acacia and introduced her to a young student, saying that the student wanted to be a graphic designer and work with magazines, that perhaps Acacia could give her some advice in that she had achieved it. and I am not easily impressed. 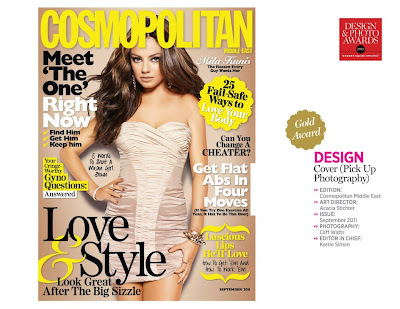 Cosmopolitan, first published in 1886 as a family magazine, is now published in 66 international editions distributed in over 100 countries. Every 2 years the editors and publishers from all 66 Cosmos gather at the International Cosmic Conference to discuss all things Cosmo. This year’s conference, being held in Madrid now, for the first time featured the Design & Photography Awards, with gold, silver and bronze awards in the following categories. 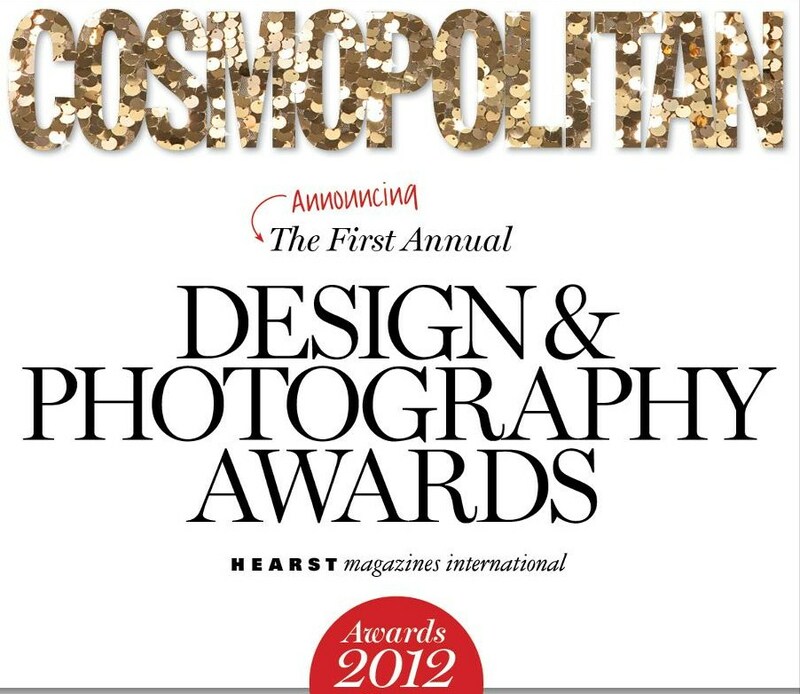 Cosmo Middle East, a small team of 5 women and in existence for only 12 months, won gold for Best Typography and for Best Cover Design, pick up, and silver for Best Cover Design, original photography and for Issue of the Year. Two firsts and two seconds out of eight categories aaginst 65 international editions, including the US, England etc. 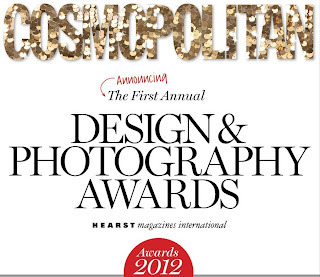 In addition, the following night, Cosmopolitan Middle East was awarded the honour for overall Magazine of the Year. Well done Acacia and the girls: editor in chief Kerrie; fashion and beauty director Chee; deputy editor Aoife and photo editor Christina. right now, you like me!" Hey there Fun, Fearless, creative people!! 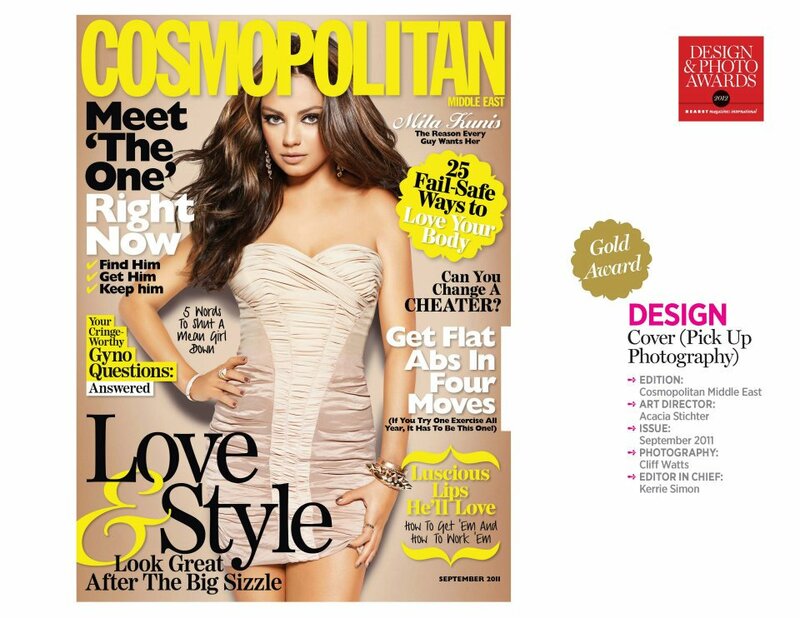 I was (and still am) hugely honoured to work on the launch of Cosmopolitan Middle East. 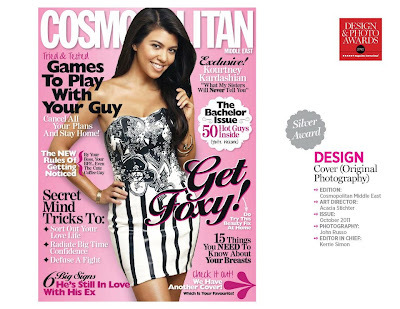 Having worked on Cosmopolitan Australia (in my home town of Sydney) for eight years and also art directing the launch of Cosmo Bride and Cosmo Hair & Beauty, the thought of launching Cosmo into a region where women are still learning to claim their independence in all facets of their lives was not only a slightly terrifying challenge, but a massive milestone to be part of. As part of a tiny editorial team (four and a half of us!) I’m proud that I am able to design every page of the magazine in a style that is unique to our edition. I’ve also directed shoots (including our Kourtney Kardashian double-cover shoot) and our 50 Hottest Bachelors (another big turning point for the region!). When I was offered the job of Art Director on Cosmo Middle East, I was at a stage of my life where I was looking for a challenge, something I could sink my teeth into while feeling that I was offering a service to women. What I got was a massive adventure that has allowed me to work on the brand that I’ve always loved, in a region that I have fallen head-over-heels for. It’s so rewarding to hear that local women are loving our magazine, and that we’re the highest-selling magazine in the region. It’s a year since I made the move to Dubai, and when I think of how much I’ve learned, discovered and achieved in those short 12 months, it only makes me more determined to see in the next 12. As the shopkeeper's heart melts, he gets down on his knees, so that he's on her level, and asks, "Do you want a widdle white wabbit or a thoft and fuwwy bwack wabbit or maybe one like that cute widdle bwown wabbit over there?" She, in turn blushes, puts her hands on her knees, leans forward and says in a quiet voice,"I don't think my python weally givth a thit"
After signing a recording contract and called The New Journeymen, group member Cass saw an interview on TV with the Hells Angels. One of them said something like "We call our women ‘mamas’.” Cass said, "Well, we got Mamas in our group and we got Papas!" Group member John said “Yeah, we could be called the Papas and The Mamas.” Cass and Michelle didn’t agree and they became the Mamas and The Papas. The Mann-Hugg Blues Brothers were formed in London by keyboard player Manfred Mann and drummer Mike Hugg, but changed their name to Manfred Mann and the Manfreds at the request of their producer. Originally titled "Matchbox 20," the band took its name from a softball jersey with a "20" on it and a patch that had "Matchbox" written on it. The band altered its name to "Matchbox Twenty" after the release of its debut album Yourself or Someone Like You..
Lars Ulrich was helping a friend think of a name for a metal fanzine. The choices were Metal Mania and Metallica. Metal Mania was chosen for the magazine & he used Metallica for his band. They were originally called "M & B 5" because they wanted to perform in a Birmingham brewery called 'Mitchell's and Butlers.' The building had a big 'MB' on it. It never happened so they changed the name to 'Moody Blues' an Elvis hit, which was one of Justin Hayward's favourite songs. (He later wrote his own Moody Blues song). Frank Zappa's highly experimental band was originally just called the Mothers, their record label asked them to change it because it could be taken as an obscenity. Out of necessity they added "of Invention" since "Necessity is the mother of invention." From a friend's comment, "What a motley-looking crew." 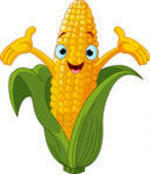 Motley means "of great variety" and once described the appearance of a court jester. The re-spelling was their own invention; using the umlauts (the purely decorative dots over the top of the “o”) came to them while they were partying and drinking Löwenbrau beer. British slang for a drug user who uses a lot of speed. Some say it derived from the American Football term but, according to most sources, the name is derived from the nickel (money), which Mike Kroeger frequently had to give customers back in change when he was working at a Starbucks coffee shop and would frequently say "Here's your nickel back". Trent Reznor said in 1994 that he coined the name "Nine Inch Nails" because it "abbreviated easily", rather than for "any literal meaning". Other rumoured explanations have circulated, alleging that Reznor chose to reference Jesus' crucifixion with nine-inch spikes, or Freddy Krueger's nine-inch fingernails. In Buddhism it means the state of perfect blessedness attained through the annihilation of the self. Kurt Cobain heard it whilst watching a late night special on Buddhism. From the last letter of each band member's name: justiN, chriS, joeY, lanstoN and jC. 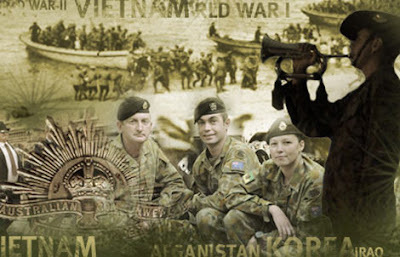 For the information of overseas readers, 25 April 2012 is Anzac Day in Australia and New Zealand, the national day of remembrance. The day is named after a combined military force of those two countries, the Australian and New Zealand Army Corps, which participated in the first major military action of those two countries in 1915 at Gallipoli in Turkey. 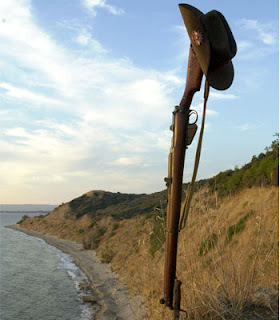 The Gallipoli campaign, although a military failure, is considered to be a significant event in the founding of the Australian nation, spirit and identity. Anzac Day is marked by dawn services, including one at Gallipoli, by marches in capital cities and towns, and by numerous remembrance ceremonies. It is the most sacred secular day in Australia and New Zealand, the nations honouring their war dead and thanking those surviving, from all wars. 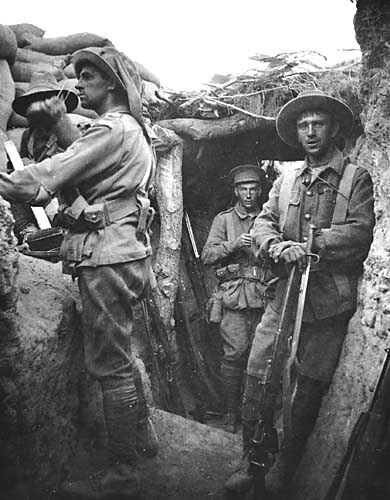 Australians in captured Turkish trenches at Lone Pine,Gallipoli, 6 August 1915. A few weeks ago Sue enquired as to the origin of the phrase “neck of the woods”. The term “neck” in this context originally meant narrow strip of land but came to be applied in the US to a narrow section of woods and eventually to the area of one’s home or settlement. Writing and thinking about necks at that time started me also wondering why the famous or, more appropriately, the infamous, Battle of The Nek was so named. This was a WW1 battle fought by Australian troops as part of the Gallipoli campaign in Turkey. The name had always struck me as strange but I hadn’t looked into it. The following item was written by me at the time of writing about necks but, because it became lengthier than intended as I found the history more and more fascinating, I thought that I would save it for an Anzac Day post. The Nek was a narrow strip of ridge with steep drops on either side, on the Gallipoli Peninsula. The word “Nek” is Afrikaans for “narrow pass”. The Nek connected the Australian trenches on the ridge known as “Russell’s Top” with a knoll known as “Baby 700” held by the Ottoman defenders. On 7 August 1915, two regiments of the Australian 3rd Light Horse Brigade, their horses left behind in Egypt, attacked the Turkish trenches on Baby 700. The slaughter became known as "Godfrey's abattoir", after Major General Sir Alexander Godley, the commander of the New Zealand and Australian Division of which the 3rd Light Horse was a part. Some thoughts on religion . . .